The Trellis Restaurant, located in Colonial Williamsburg, is one of the finest and most innovative restaurants in the country today. Now, award-winning chef Marcel Desaulniers shares his original, yet traditionally inspired, recipes in a cookbook that truly captures the informal elegance of the restaurant itself. With Desaulniers's simple, easy-to-follow directions, anyone can re-create the Trellis hallmarks -- Curried Apple and Onion Soup, Shiitake Mushroom Pâté, Chesapeake Bay Clam Chowder -- that will start off any meal with panache. Go on to enticing entrées such as Smoked Catfish with Country Ham, Grilled Duck Breast with Raspberries and Macadamia Nuts, and Loin of Lamb with Fennel and Curry. Pumpkin and Currant Bread and Black Pepper Brioche are the perfect accompaniments to any meal, and delectable desserts -- Strawberry Papaya Sorbet and Death by Chocolate -- provide luscious finales. 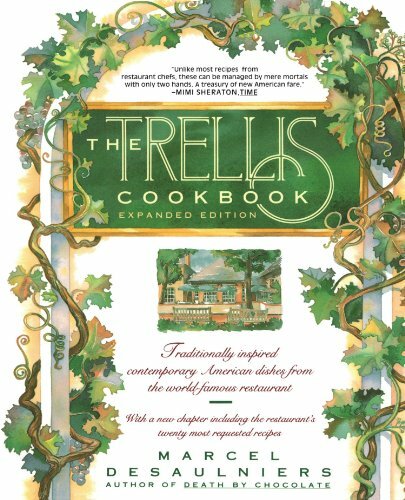 A new chapter -- twenty of the restaurant's most requested dishes -- and a unique feature, "the Chef's Touch," in which Desaulniers offers his secrets and advice, make The Trellis Cookbook the culinary chef d'oeuvre of new American fare -- and the ideal addition to every cook's home library.